England’s hopes of winning their first World Cup since 1966 ended on Wednesday after their defeat to Croatia in the semi-final. Yet, England remains a winner on one metric: club-wise representation in the World Cup. More players in the 2018 World Cup plied their trade for clubs in football leagues in England than in any other country. England was the winner on this count when the tournament began. It gained numbers as the tournament progressed, losing its league-leading status only in the finals. Each of the 32 teams brought 23 players to the World Cup. That’s a total of 736 players, and they came from 310 clubs across 55 countries. Five European leagues—English, Spanish, German, Italian and French—dominated, accounting for 51% of these 736 players. The Premier League accounted for 124 players, or 17%; 28 of the 32 teams had at least one player from an English club. Spain’s La Liga and Germany’s Bundesliga accounted for 11% and 9% of the total players, respectively. 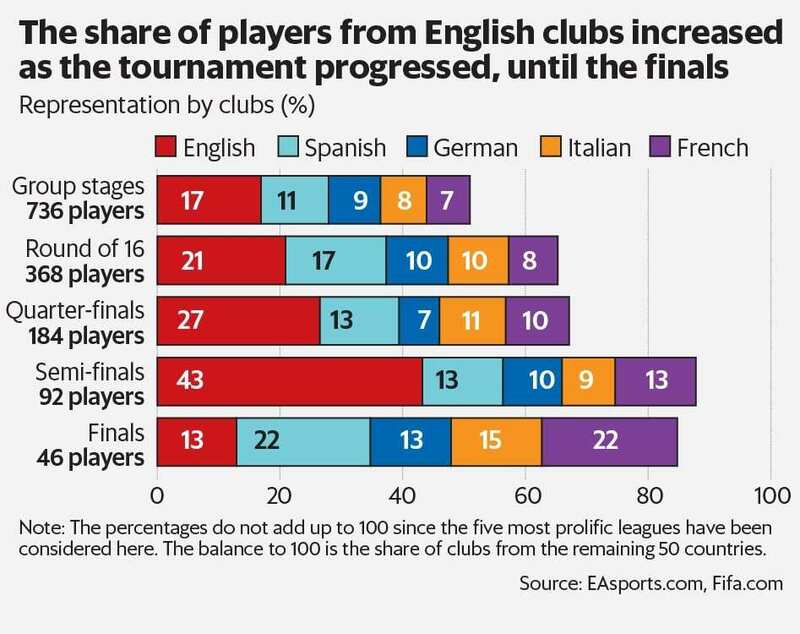 As the tournament progressed, the share of players from English clubs increased: 21% in the Round of 16, 27% in the quarter-finals and 43% in the semi-finals (see chart). England going deep in the tournament was one reason for the dominance of the Premier League in this World Cup. All 23 players in the English team play in their domestic league. Dependence on the local league was also high for Russia (21 players) and Saudi Arabia (20 players). However, neither is a contender even at the national level nor do they boast of a club culture that is a global draw. Even if the entire English national team were excluded from this calculation for the quarter-finals and semi-finals, English clubs would still lead Spanish clubs, the next best: 14% versus 13% in the quarters, and 18% versus 13% in the semis. These numbers underscore the dominance of English club football on the global stage. According to the Uefa Club Licensing Benchmarking Report 2016, a rich statistical document on European club football, the average annual revenue of English clubs in the top football division was £244 million, against £150 million for German clubs and £126 million for Spanish clubs. Among individual clubs, England made its presence felt at every stage in Russia. In the group stage, two of the top five clubs in terms of player representation were English. This increased to three in the Round of 16 and four in the quarter-finals. In the semis, all top five clubs were English, a construct of the homegrown composition of England’s national squad. With England losing to Croatia in the semi-finals, this has changed for the finals. There’s no English club in the top six. Instead, there are three players apiece from three Spanish clubs (Atletico Madrid, Barcelona and Real Madrid) and three from French clubs (Monaco, Olympique Marseille and Paris Saint-Germain). The numbers, in a sense, mirror the club story. English clubs have led in revenues and talent, but they have not won the top prize in European club football since 2011-12. And the Three Lions will have to wait for at least another four years to get their second World Cup. howindialives.com is a database and search engine for public data.